“The Embedded Traveller” follows Outpost columnist Carla Bragagnini across the world, where she learns different skills from artisans, artists and craftspeople. Read the rest here. It’s hard to believe that untouched places like this still exist. 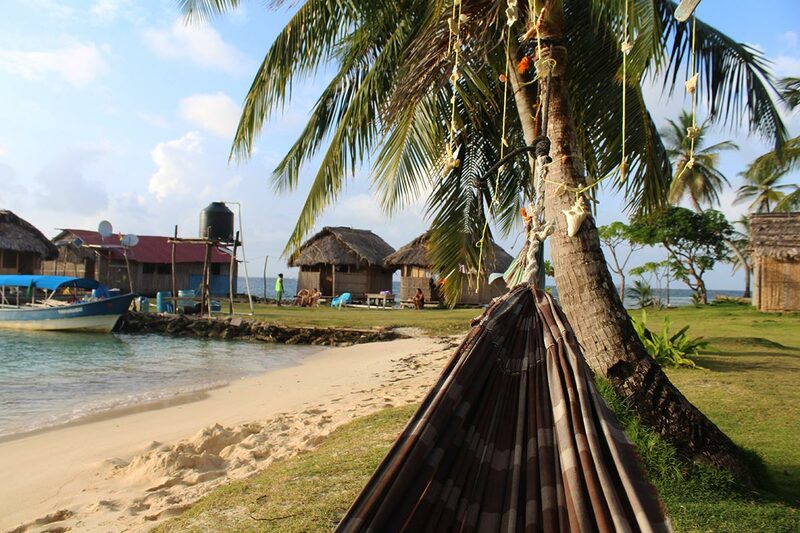 From just a few kilometres off Panama’s Caribbean coast, the Kuna Yala islands—also known as Guna Yala or San Blas—are an archipelago of more than 360 picture-perfect islands. Take your pick, there’s practically one tropical island for every day of the year. The reason they’ve stayed this way is that they are protected by the Kuna Yala indigenous community, who have fought hard to keep rights over their land and restrict tourism there. On any given day, they know how many people to expect and visitors are always considered guests of the Kuna. “We are completely autonomous from the mainland,” Roberto, our Kuna tour-shuttle driver, told me. “But we do hold seats in the Panamanian legislature.” In Latin America, it is a rare feat for indigenous populations to emerge from centuries of settlement with cultural traditions and political autonomy intact. Roberto picked us up in a 4×4 from our Panama City hostel, Luna’s Castle, and drove us north through the lush green hills on a dangerously winding road. 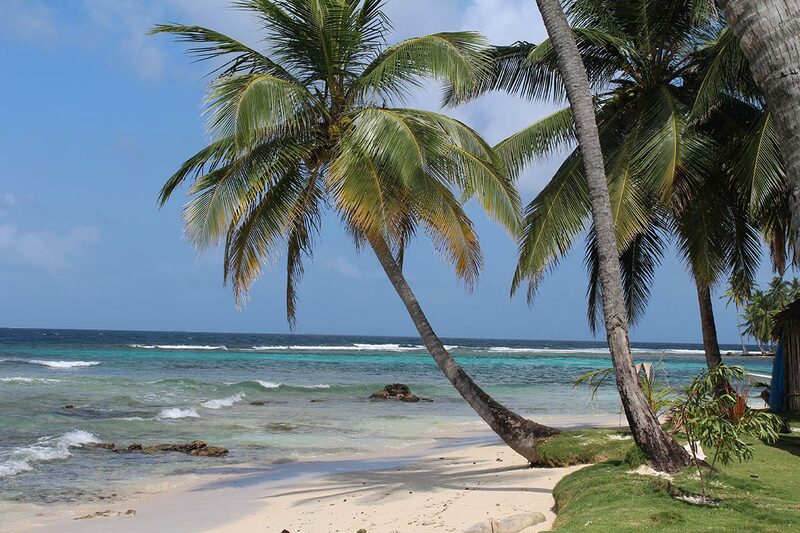 The Kuna Yala islands are a postcard of paradise. When we entered Kuna territory, I first saw them at the port. 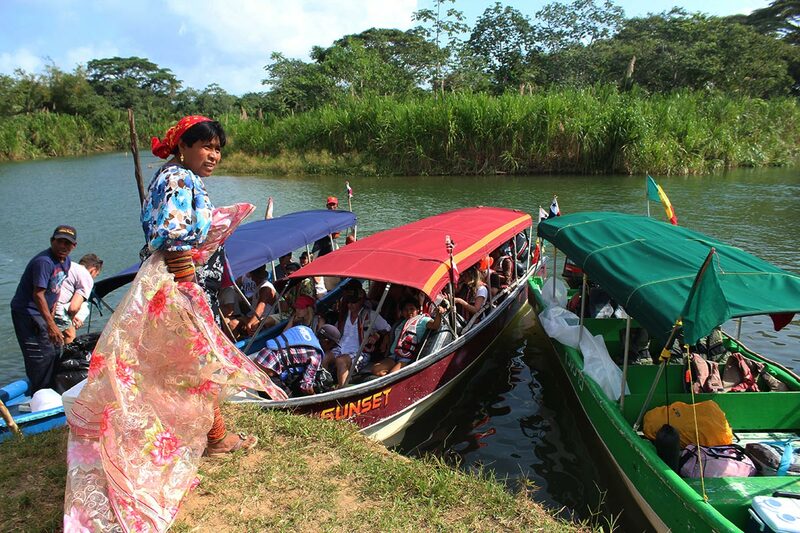 Dressed in dazzling blouses, hand-stitched accessories, patterned head scarves, golden nose rings, beaded leg- and armbands, with painted lines down their noses, the brightly coloured Kuna women were loading shopping bags onto the boats. They held my attention, but I soon got distracted by a wave of plastic sheets carried by everyone around me. As I stepped onto the motor boat, I was given my own. A few minutes into the bumpiest ride I’ve experienced, and the mystery was solved: the plastic sheets became our refuge for the next 45 minutes through choppy waters, as we tried our best to keep dry. In peeking through the sheets, I think I caught a glimpse of the clear waters and palm tree–lined islands, but it also could’ve been the head rush. If you’re gonna ride to Kuna Yala, you’re gonna need a plastic sheet. In the end, the big reveal from the plastic sheets did not disappoint. Robinson quickly jotted our names in his logbook. “And you, where are you from?” he asked me in Spanish—which they speak, but preferably as a second language to their native Kuna. “I’m from Peru originally,” I replied. “Ah yes, Peru,” he looked up at me and smiled. “Fujimori,” he added, referring to our infamous and exiled former president. He went around to the rest of the group and asked everyone’s names and nationalities for his records. “Ah yes, Germany. Merkel,” he continued down the list. He made us laugh, as he had something to say about the country of every guest—all of which felt like a lifetime away from here. Despite living on a remote island, the newspaper on his desk proved he was up to date on current affairs. 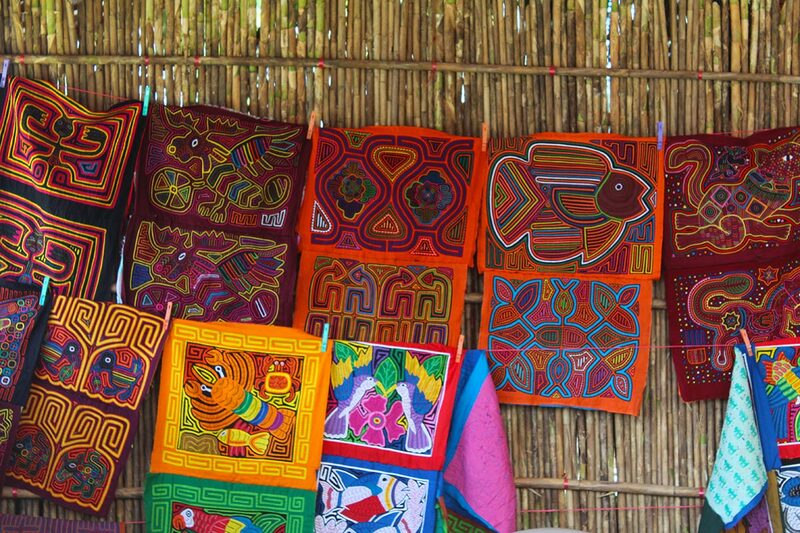 The Kuna Yala’s infamous molas, intricately weaved designs on cloth. Robinson’s island was as isolated as it gets. With a daily boat on and off, half the land is occupied by Robinson’s hotel of sorts—around six Kuna-style thatched huts—with no added embellishments, amenities or luxuries. When you stay with him, he provides delicious and local meals; unless you want to climb trees for coconuts or can catch fish with your bare hands, your dietary options are limited. This setup allows you to coexist with the rest of the island, which is a fully functioning Kuna village. Villagers here make their livings off agriculture, fishing and, most recently, tourism. I went for a walk around our little island paradise when a Kuna woman caught my eye from across a small courtyard surrounded by huts. We looked at each other curiously; she saw my camera over my shoulder and encouraged me to approach. “Is it okay if I take your picture?” I asked her in Spanish. She smiled and nodded. She was dressed spectacularly from head to toe in vibrant colour and was working on attaching an intricately hand-stitched mola panel to a blouse. 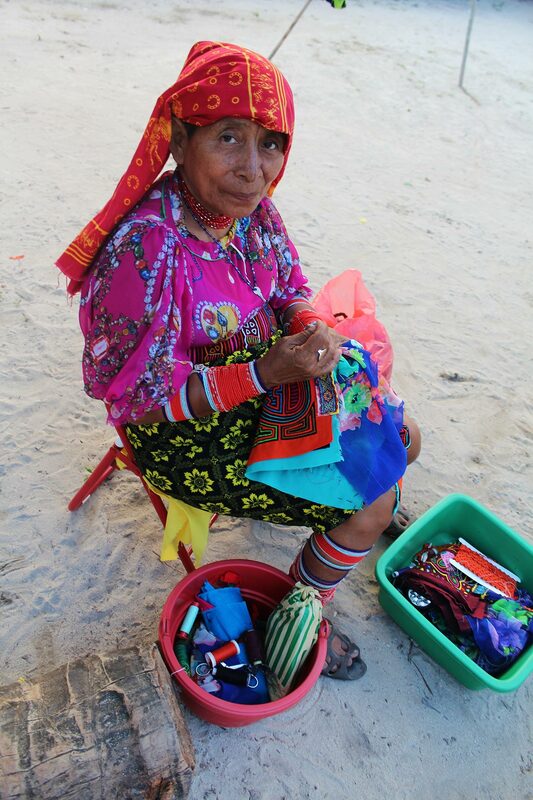 In Kuna, mola actually means “shirt” or “clothing.” The molas are stitched to make up the bottom front and back parts of the blouse. The geometric designs have origins in body paint, and it was only after European settlers arrived in Panama that the designs were stitched into to newly available cloths. The first thing you notice about the molas is that even the smallest spaces are stitched. This is due to the belief that evil spirits can enter empty spaces. The bright colours of the clothing and the designs of labyrinths and zigzags, symbolizing teeth, are also stitched to help scare off spirits. The triangles represent Kuna huts and the lines represent the sunbeams that enter through the bamboo walls, giving the feeling of family, home and protection. Other designs include the depiction of local flowers, birds and sea life. It’s hard to believe when you meet and interact with the peaceful Kunas that when the Panamanian government tried to erase their traditions and customs, their resistance resulted in a revolution in 1925. The molas have since become a symbol of freedom. I was back at Robinson’s at around 7 p.m. and it was lights out because, well, the sun went down. With no electricity, that was the end of the evening. I closed my eyes and heard the sweet sounds of waves crashing in the distance and Robinson’s contagious laughter echoing through the village. It might have been hard getting here, but that night, I slept feeling infinitely grateful that a place like this does, in fact, still exist. Carla Bragagnini a Peruvian-Canadian freelance writer and Outpost contributor who penned a series for outpostmagazine.com while undertaking a bucket-list mega trip. Along with Peru and Canada, she's lived in Australia, Spain and Germany, and has travelled to more than 40 countries. She is also associate online editor for infromtheoutpost.com Peru.